Versatile and beautiful outdoor tiles are the ideal solution for creating a more textured exterior that gives your outside space an inviting appeal. Eliminate boring concrete by adding a more natural and richer look to patios, steps, and walkways. Outdoor tiles from PetraSlate Tile and Stone are affordable and will provide long-lasting refinement to any outdoor space. Consider ways that outdoor stone tiles might change the appearance of your outside areas and features. Patio tiles are available in a range of colors and styles that can be shaped to fit any space you want. Stone tile steps and walkways can create an elegant entryway that turns a boring approach into an inviting and luxurious access. Your imagination is your starting point. With PetraSlate in Denver’s broad selection of outdoor tiles, plus expert advice as needed, you can create the exact atmosphere you seek. PetraSlate’s selection of outdoor tiles includes a variety of stone types, sizes, and colors. Their exterior line by Silver Creek consists of Slate, Limestone, Travertine, Antique Travertine, as well as a Barn Plank line. 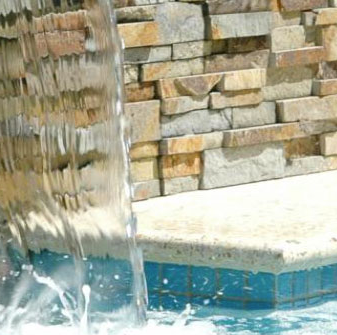 Each of these products has the external appearance, durability, and feel of natural-cut stone, but are far easier to install and are more economical. PetraSlate’s most popular stone tile product for patios and walkways is the Silver Creek’s Slate landscape tiles. Individual pieces are produced in a range of rectangular and square dimensions, with even bull-nosed tiles to soften the edges. Variations in tile size allow for the creation of Versailles or other appealing patterns. With a rugged thickness of 1.5” for each tile, the product is consistent and easy to install. The color options vary in the same ways that natural slate differs. Silver Creek’s Slate landscape tiles are available in Cream, Bluestone, Western Buff, and Fond du Lac. The latter is a blend of natural gray, charcoal and sandstone. Besides patios, PetraSlate outdoor tiles from Silver Creek are versatile and can be used to surround swimming pools, create walkways that meander through garden areas, surround outdoor cooking islands, and provide stepping stones. Slate pavers are used to create stone wall borders and barriers around patios and garden areas. Adding a vertical dimension to your patio arrangement creates a more defined, cozy feeling to your space. Call the experts at PetraSlate for information about their extensive exterior hardscape offerings today at 303.280.9595.